Security Without War - World Beyond War . . .
Militarism has made us less safe, and continues to do so. It is not a useful tool for protection. Other tools are. The momentum of the military-industrial complex works through the hammer-nail effect (if all you have is a hammer, every problem looks like a nail). What’s needed is a combination of disarmament and investment in alternatives (diplomacy, arbitration, international law enforcement, cultural exchange, cooperation with other countries and people). The most heavily armed nations can help disarmament in three ways. First, disarm — partially or fully. Second, stop selling weapons to so many other countries that don’t manufacture them themselves. During the Iran-Iraq war in the 1980s, at least 50 corporations supplied weapons, at least 20 of them to both sides. Third, negotiate disarmament agreements with other countries and arrange for inspections that will verify disarmament by all parties. A fair and democratic international system of law is needed. The United Nations needs to be reformed or replaced with an international body that forbids war and allows equal representation to every nation. The same goes for the International Criminal Court. The idea behind it is exactly right. But if it only prosecutes tactics, not the launching, of wars, and if it only prosecutes Africans, and only Africans not cooperating with the United States, then it weakens the rule of law rather than expanding it. Reform or replacement, not abandonment, is needed. Pingback: Security Without War – World Beyond War | stopthemadness! 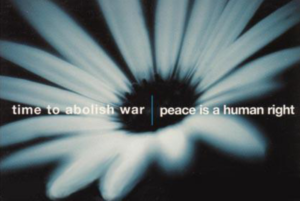 Do you believe that there is an alternative to war? The answers you will get to the first 2 questions are predictable, to the third less so. Economies depend on war to give people the consumer goods and services they crave/need? a) more egalitarian alternatives to the dominant economic system (neoliberal capitalism) which do not create endemic poverty have to be worked out and explained in terms that people can understand. b) Education systems throughout the world will need to be much more open and broadly based on skills of critical thinking, reflecting, communicating, empathizing, understanding and self-management. They will also need to have strong international component that links children and adults with others around the world. c) Common threats to life on earth such as climate change, loss of bio-diversity, polluted oceans, air and land-masses will need to reach the consciousness of ordinary people so that they have the sense of fighting a common global cause. d) World religions will need to stop competing with each other for adherents and will need to stop brain-washing children at an early age that theirs is the only possible pathway through life. e) Human population growth will need to be controlled. Already the human race is at an unsustainable level on this small rock hurtling through space. 4. Of these b) is the key. What is needed is a step increase in the capacity of all human beings to think for themselves and to stand up for peace. If the next generations are to clean up the mess that our generation has created, education, or more accurately human learning, will have to give them the mental tools to do the job. But these are all longer-term solutions. In the short and medium term every effort should be made to provide and broadcast a set of inspiring and practicable guidelines on alternatives to war, and to build up an international cohort of citizens for peace. The UN does its best, but when its largest contributor takes away its contribution to UNESCO to please one of the most warlike middle east states, it stands little chance of success. …also, one comment on part (e), “Human population growth will need to be controlled.” Henry George answered this quite well noting that, unlike other species, humans don’t reproduce to infinity under ideal conditions. Human birth rates are lower in regions where people are better provided for, and higher in regions where people are poorly provided for. Overpopulation isn’t a problem at all, once cooperation starts to replace competition as our main social value. Moreover, as to “Already the human race is at an unsustainable level.” Again, Henry George notes that there is far more food and space available on Earth than we can possibly use. The problem is unfair distribution. As examples he notes that during famines in Ireland, India, Brazil, etc., huge amounts of food were exported from those countries! It wasn’t that they’d run out of food, it was that those controlling distribution weren’t concerned with sharing to the people, but to whoever would pay highest prices. Pingback: Memorial Day THIS | WE ARE NOT YOUR SOLDIERS!